The early risers are at it again… It’s so annoying! The guy on the bunk above me wakes me at just after 4am by clambering around for the toilet and then climbing back up. Others begin to rustle and clatter around by 5.15am… I could backhand the lot of them. I wait until most of them have cleared the area before I get up, 5.45am. I’ve been bitten in the night, I have a huge swollen bite mark on my lower left leg. I share my watermelon (amazing I know, fruit at breakfast time) with a couple of pilgrims who didn’t disturb me, before making my exit. The morning light is so warm, as I walk my path out of Puente la Reina. I stop to take pictures of the landscapes approaching. I wait for pilgrims up ahead to clear the scene, whilst making sure no others enter the frame from behind. As I stop to take another picture, an older gentleman, German, pauses to ask if it’s a good picture, but instantly walks into frame and stops to take his shoe off before I get the shot. (Now I promised my mother I wouldn’t swear on my website), but by God, he was lucky I didn’t wrap my crook around his head. Todays walking is pleasant, (besides the ignorant people I mean), along old footpaths and roman roads. 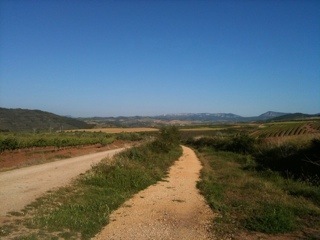 Vines and crops on either side, pretty villages laid out on the horizon, that I’d soon be walking through. I spot more vultures soaring overhead, all manner of finches in the hedgerows, butterflies I recognise and some I don’t. Finally I find a snake that isn’t instantly spooked by my approach, not quite a metre, green with two black stripes running it’s entire length. It’s hunting just off the path. It enters a hole, then comes back out, it senses me. Two more walkers come up the path and in an instance it’s gone. The sun eventually gets to hot for me so I put on my hat, which instantly soaks up all my sweat and begins to drip down my neck…. Today I’ve crossed so many bridges, all old pilgrim bridges, so pretty. Including a bridge that crosses a salt river?! I arrive in Estella just before noon, this is my stop for the night. A small town with many old streets and buildings. As I wait for the hostel to open I’m greeted by a Canadian, two Australians and two Americans. One of them I know, Alison. I met her in France walking with her partner David. He has had to fly back to the states for work but Alison plans to walk the whole way. She’s the only other person I’ve seen that started in Le Puy en Velay. A few of us go for a wander around the town. We stop for a drink before I head back to my bed. As the lights go out rain begins to fall outside, then the thunder and lightning starts. It’s a big storm. If I wasn’t locked in I’d probably want to go out and try to get some pictures…. Instead the earplugs go in!